Director: Bernhard Wicki. 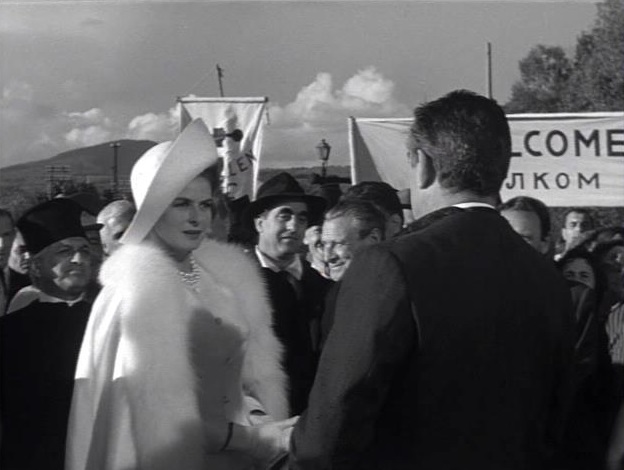 Cast: Anthony Quinn, Ingrid Bergman, Valentina Cortese, Irina Demick, Hans Christian Blech, Paolo Stoppa, Eduardo Ciannelli, Claude Dauphin, Marco Guglielmi, Jacques Dufilho, Romolo Valli, Fausto Tozzi, Giorgio Sciommer. Screenplay: Ben Barzman (based on the play by Friedrich Dürrenmatt). Twitter Capsule: Memorably bitter, especially given Bergman's history. Still, play is slightly softened. Camera a bit stiff. Interesting. VOR: ③ Euro mishmash, lacking level of direction that could pull it together or mobilize an acute, timely statement. Still, a bit amazing it got made. Bless Bergman for her taste in projects.